I plan to make a vessel each week. For 2016 I challenged myself to make a vessel each week. This did not go according to plan, as you can see by the 19 (not 52) thumbnails below. The first problem was that it often took more than one week to complete a project and it began to feel like a failure if I didn’t manage to finish in time for my blog post. The longer a project took to finish, the harder it was to continue working on it. I still have an incomplete vase/sculpture looming at me from the shelf. Another problem I had was that my definition was quite broad so it took me some time each week to decide what to work on. (As opposed to my successful 2015 challenge where each week was more defined e.g. 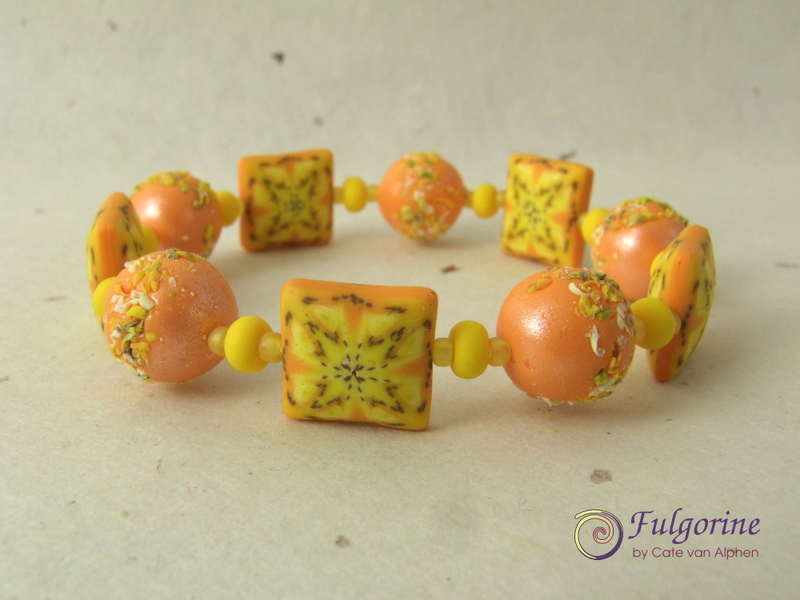 week 10 – yellow beads). 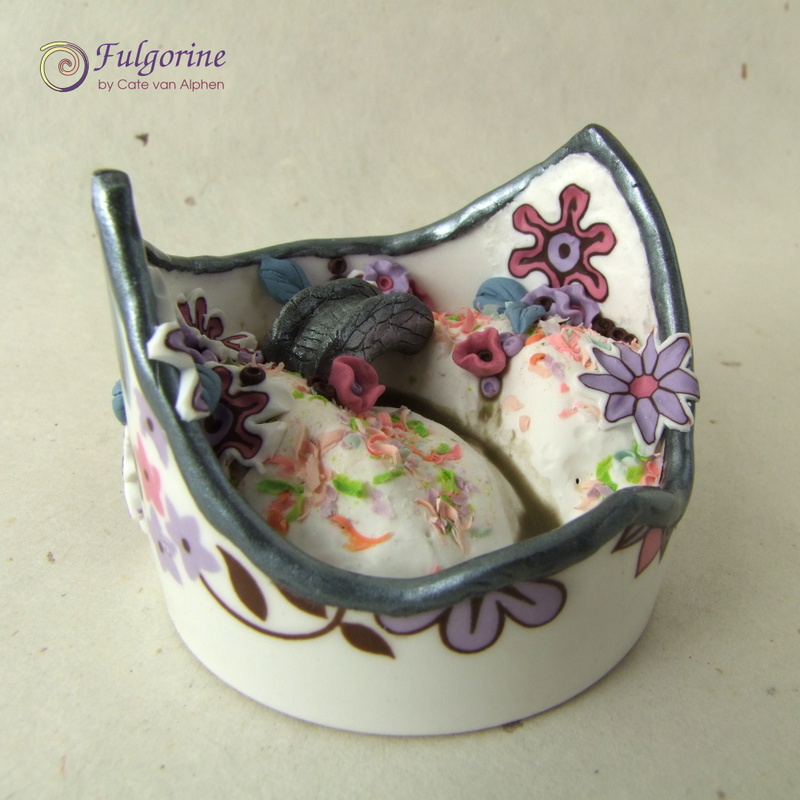 My definition of a vessel includes anything rigid you can put something into; so in addition to the obvious bowls, bottles and vases I hope to include decorative boxes, miniature teapots, inros, lockets or even poison rings. Finally, I chose the challenge because it was difficult. I have a collection of glass jars that I hoard because it seems a shame to throw them away, but I never seem to get round to decorating them. I had hoped that after forcing myself to make a few it would become easier and enjoyable. After all, back in 2012 making earrings was pretty terrifying but I joined in with the 52 Earrings challenge and I have since made hundreds of earrings. Unfortunately for the amount of time I have to clay at the moment this was just too far out of my comfort zone, and I ended up not making anything at all. 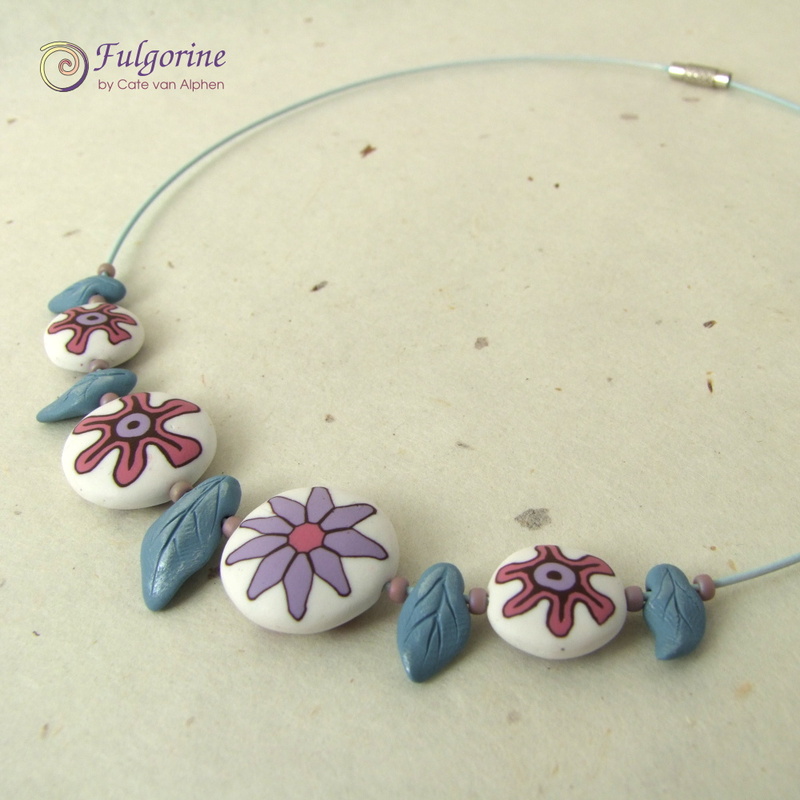 One thing I was really pleased about making this year was another polymer clay painting. It is a 10cm x 10cm tile that I made for the FIMO 50 World Project which brought together work by hundreds of artists from around the world. Unfortunately I wasn’t able to see the real thing, but I think I can spot my painting there on the globe. 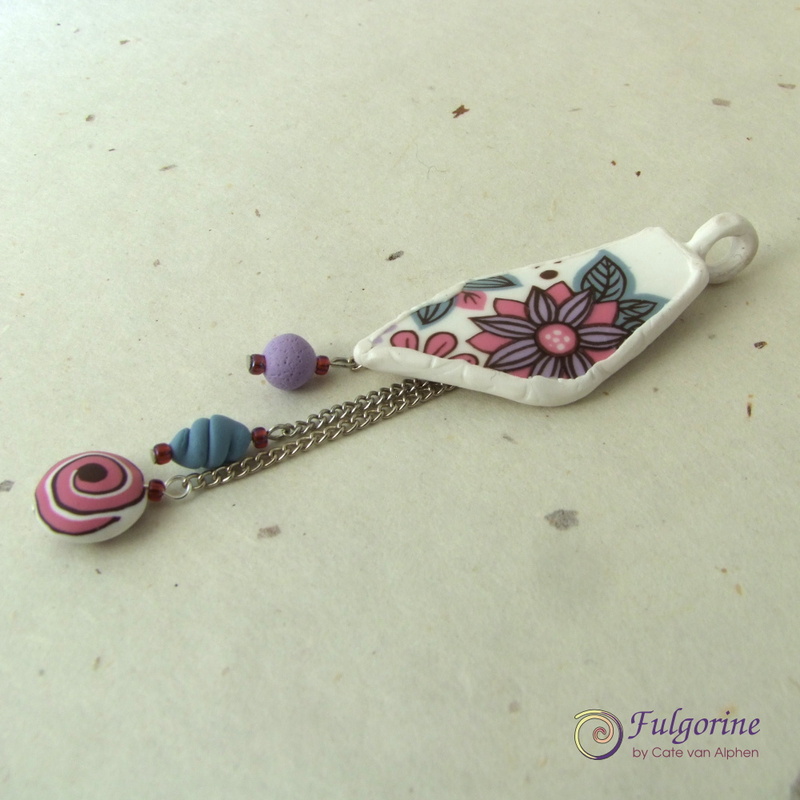 I’ve had disappointingly little time for polymer clay recently, but I have managed to make an ornament for Christmas. 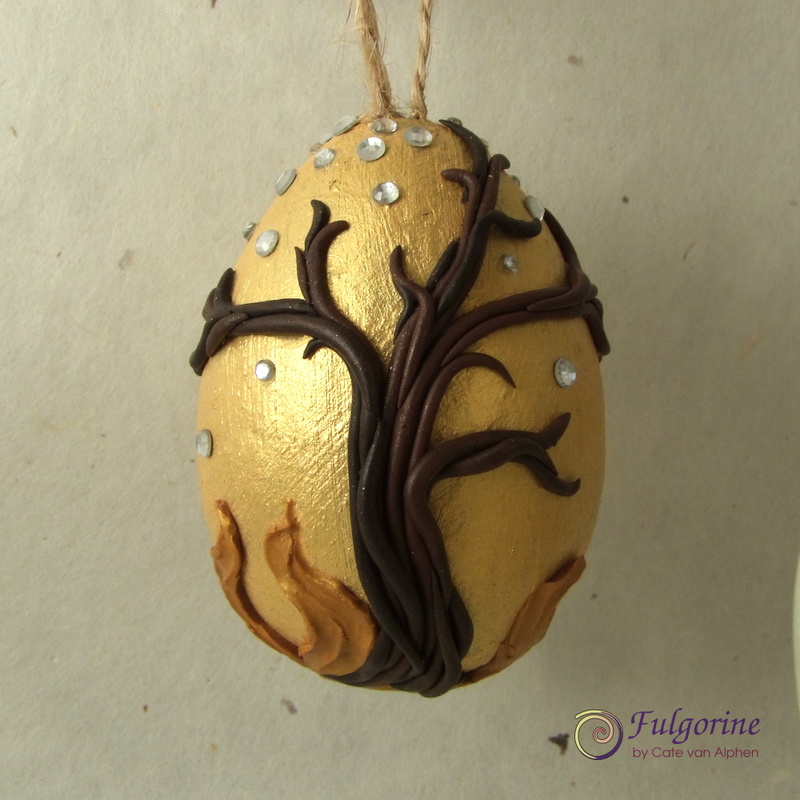 I started off with a ready-made paper mache egg that I painted with gold acrylic paint and decorated with polymer clay and crystals. You may be wondering why I have made a tree in a bushfire, but that’s not entirely what I was thinking. I wanted to make something that was specific to Christmas without the common images that you buy in the shops, so I tried to think on a more elemental level. Firstly I think all the sparkles and lights at Christmas are to remind us that even though it’s mid-winter the summer sun will come back again. 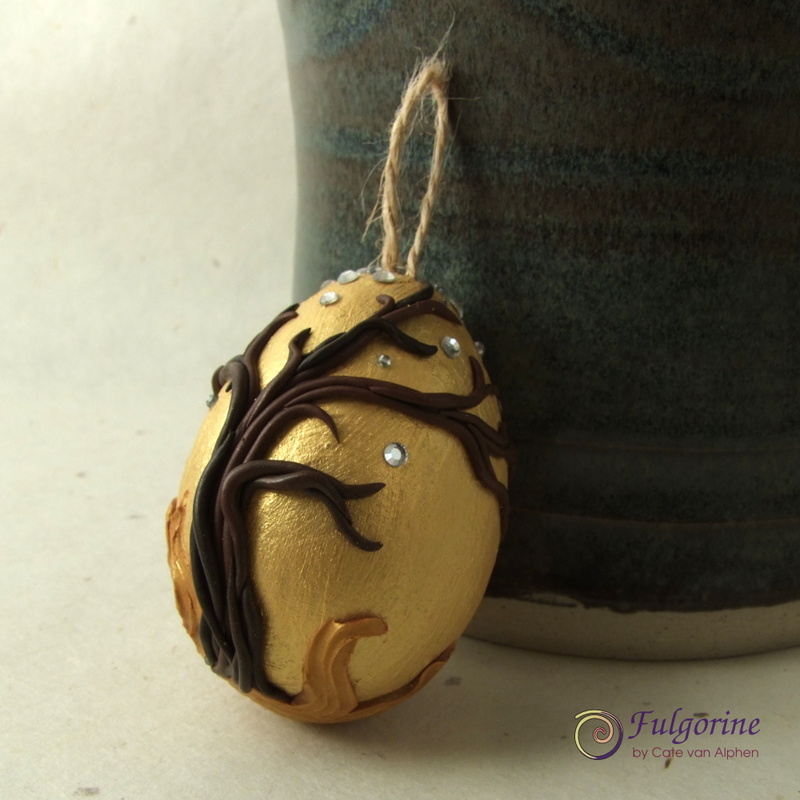 So I made my egg gold because the solstice is about the sun. 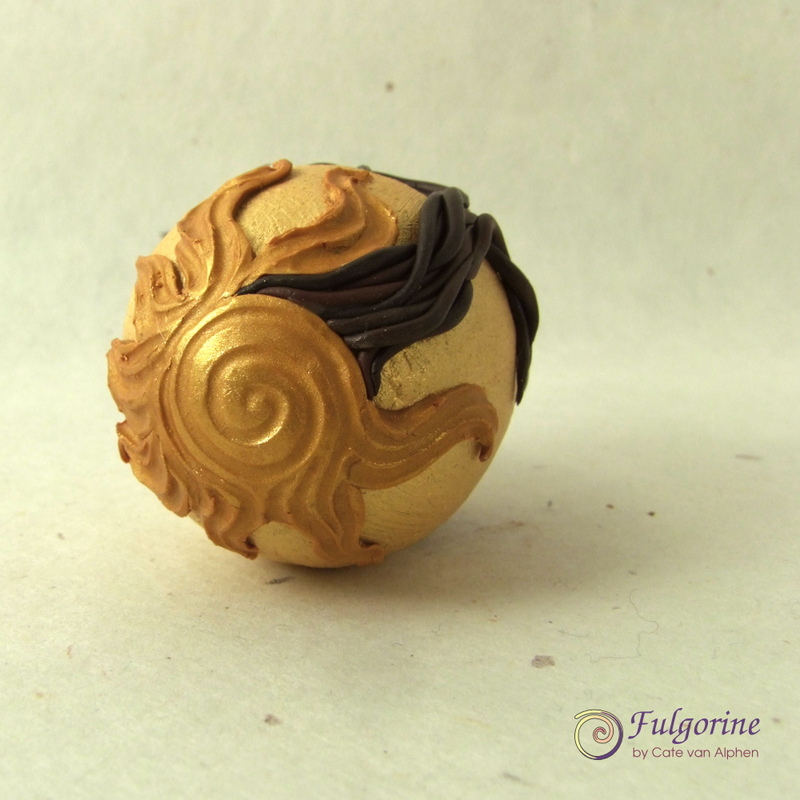 On the base of the egg I have made the sun from polymer clay. It’s on the base of the egg to show that the sun is on the other side of the world bringing summer to the Southern Hemisphere. I grew up in South Africa, and I still have family there so I think about this every year. The tree has no leaves to show it’s winter. The crystals represent snow (because it’s winter), and the stars in the sky on the longest night. They are also there because I believe that at Christmas you can never have enough bling. Unfortunately the crystals I used are not very good quality. I do have better ones, but I couldn’t find them. 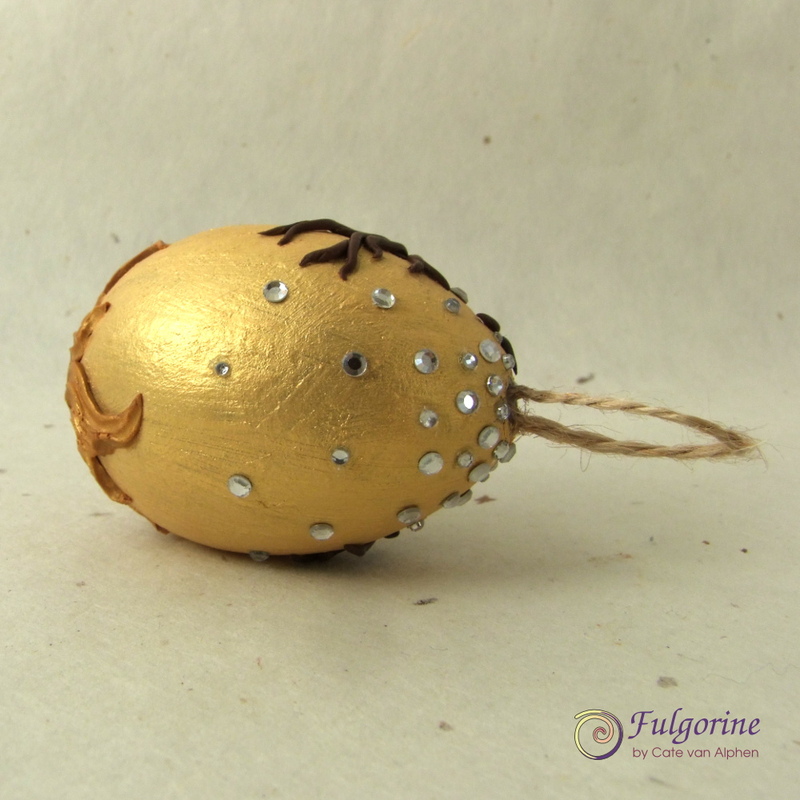 I think I imagined the egg made from real gold and diamonds, but I haven’t got the skills or budget to make it that way (this year 😉 ). 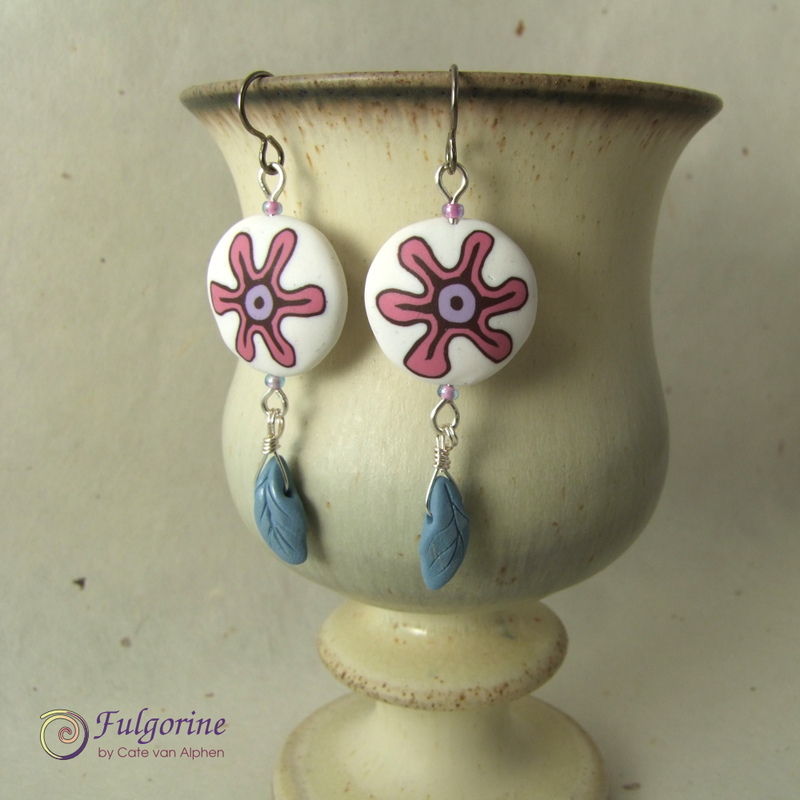 I have been a little waylaid from my polymer clay so I’ve pretty much lost track of the 2016 Polymer Clay Challenge. 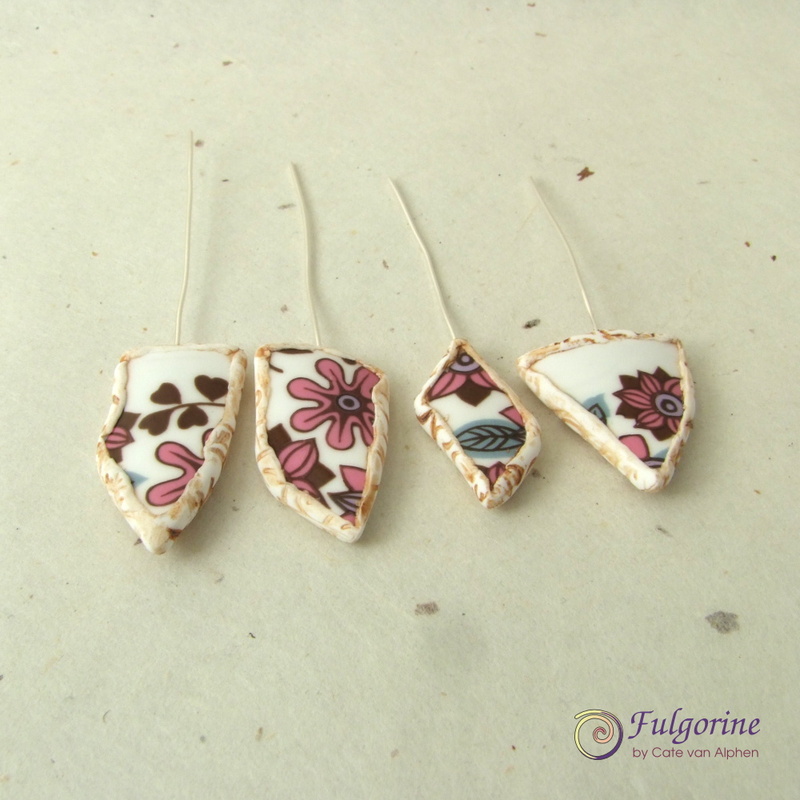 Since it has been a while since I last blogged, here is some of the jewellery I recently made inspired by the broken teacup I previously wrote about. 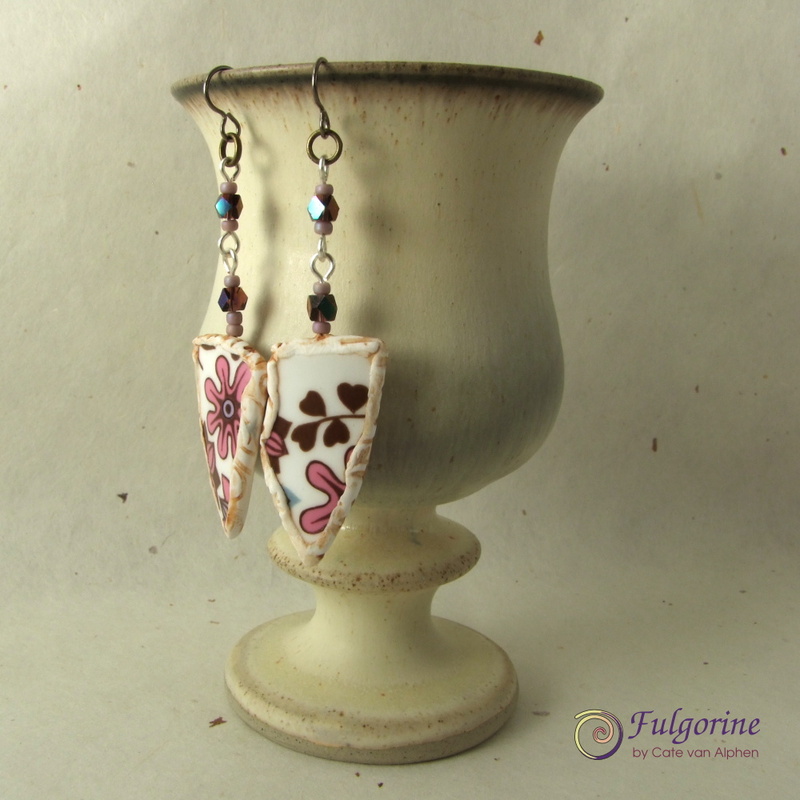 I finished some earrings and a pendant using the shards I wrote about in week 36. 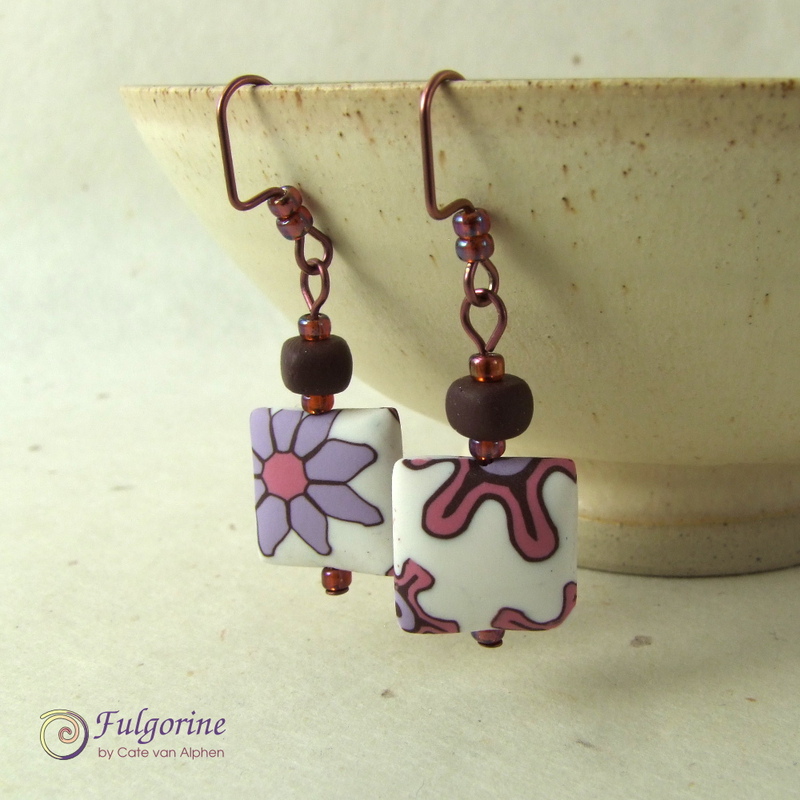 I also made some earrings to go with the necklace that I made in week 38 using canes inspired by the flower power pattern on the vintage teacup. 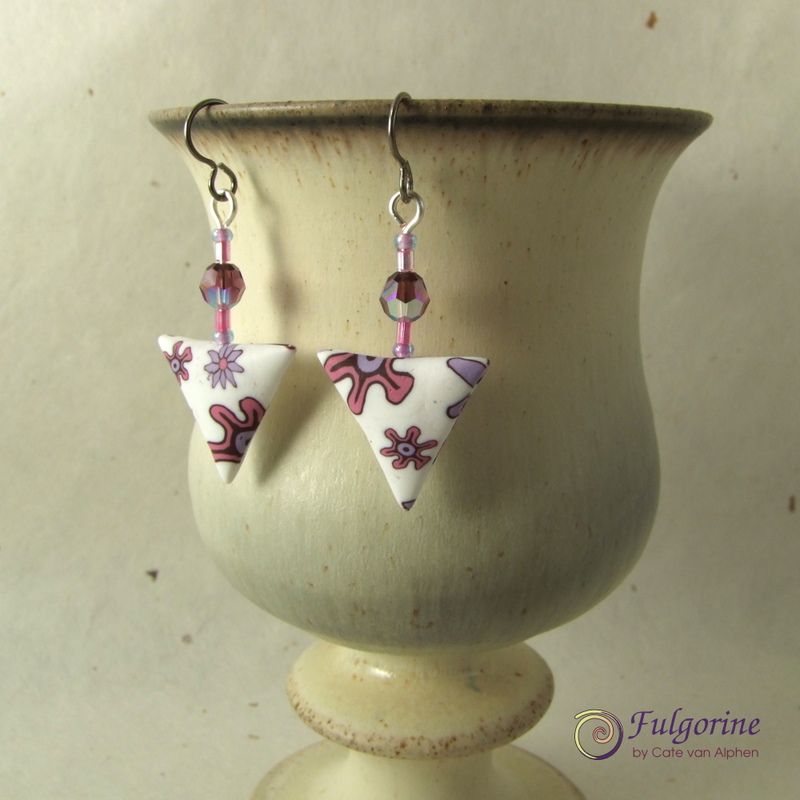 And since I had some canes already made, I made more earrings. 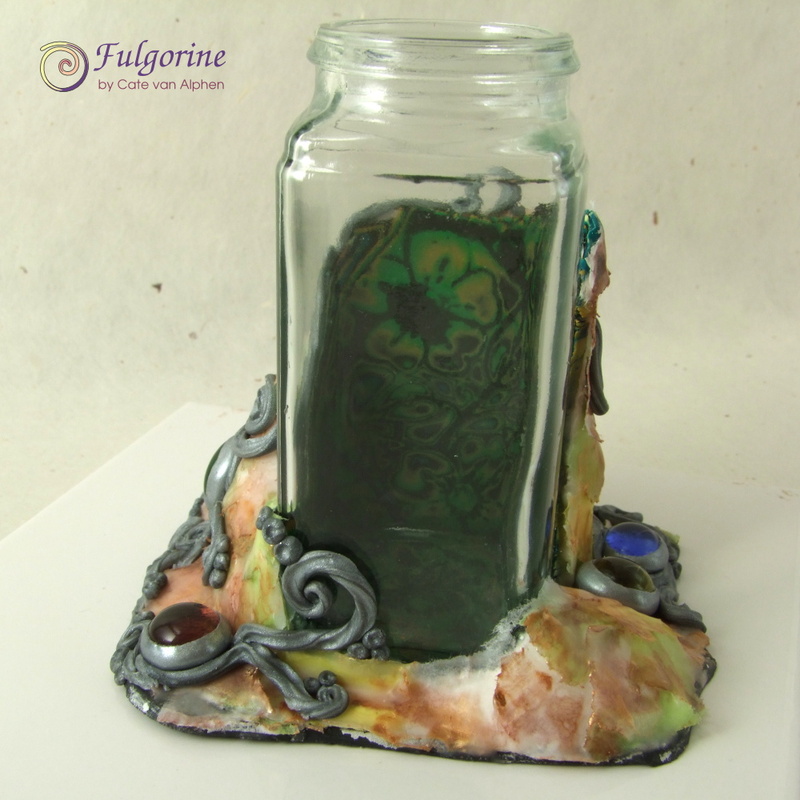 It seems my grotto bottle (which you may remember from week 23 and 24) has been waiting for the Art Charm Swap reveal*. Perhaps there is some quantum resonance as I planned to add some similar tiny frogs around the outside? The decoration is STILL not finished, but it is starting to look more interesting. I’ve added some glass gems, which I originally prepared for my Art Charms before deciding they were too big and starting again. 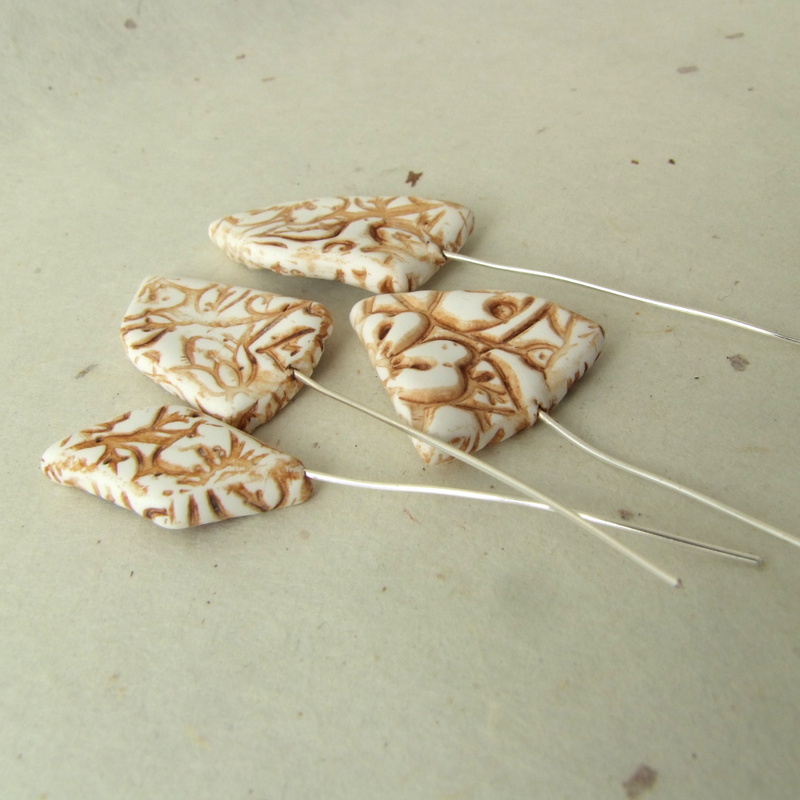 I’ve linked them together with swirls of “silver” coloured polymer clay. I was thinking of them as metallic bones in the landscape, except they now look more like liquid mercury. Perhaps the rocks are bones, and these are more like veins. I’m planning to add some moss and plants for the little quantum frogs now on my work board. There may be bugs and a fungal infection or two before I’m finished. I’ll see how it grows. Week 37 – still a vessel? I’m not entirely sure what I’ve made this week for my 2016 Polymer Clay Challenge. I decided to do something with the base of the broken cup from last week. 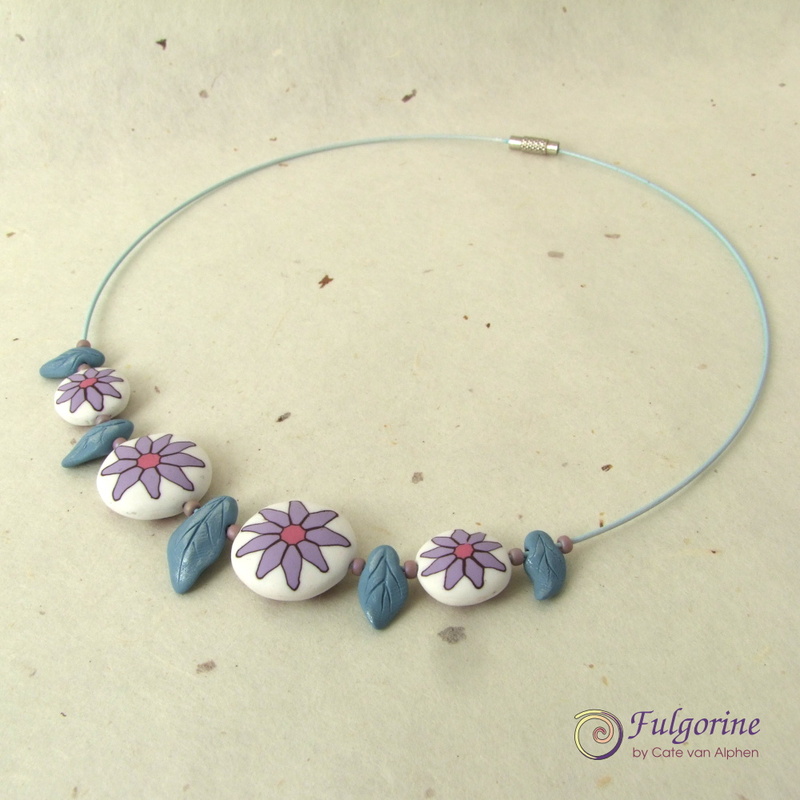 I started by covering the sharp edges with polymer clay. Then there was a scar left from where the handle broke off, so I made some retro flower canes inspired by the cup pattern to cover that and make it into a feature. I decided to make a little garden inside the teacup. And because I had massively oversized unrealistic flowers, I decided to make it an unreal fairy garden. I made the ground white to match the china cup. And there’s a silver bridge over a golden river. 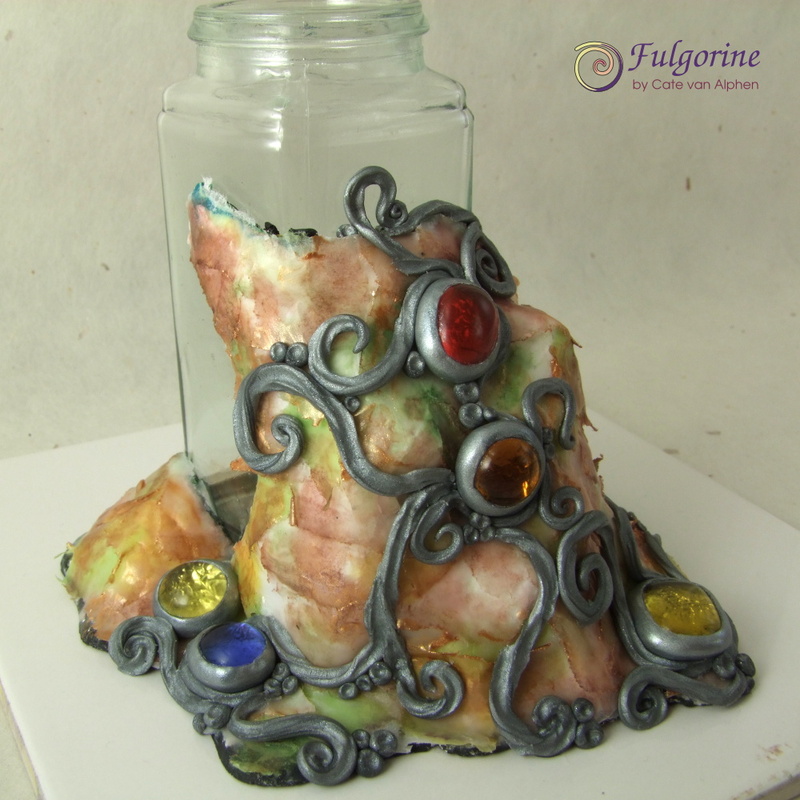 I used gold ink in liquid polymer clay for the river, but it didn’t end up as sparkly as I’d hoped. I did consider adding some residents, but my miniature work is still a bit ham-fisted. I’m not sure that it still counts as a vessel since it’s now full, so you wouldn’t really want to put other things in. My daughter says it’s a wishing garden. I suppose wishes don’t take up much room. Hooray! I have actually made a vessel this week. I sat down to make some black and white beads and ended up covering a glass dish with the leftover canes from my AJE headpin challenge. Despite taking great care to avoid air bubbles, I was disappointed that quite a few appeared after baking. 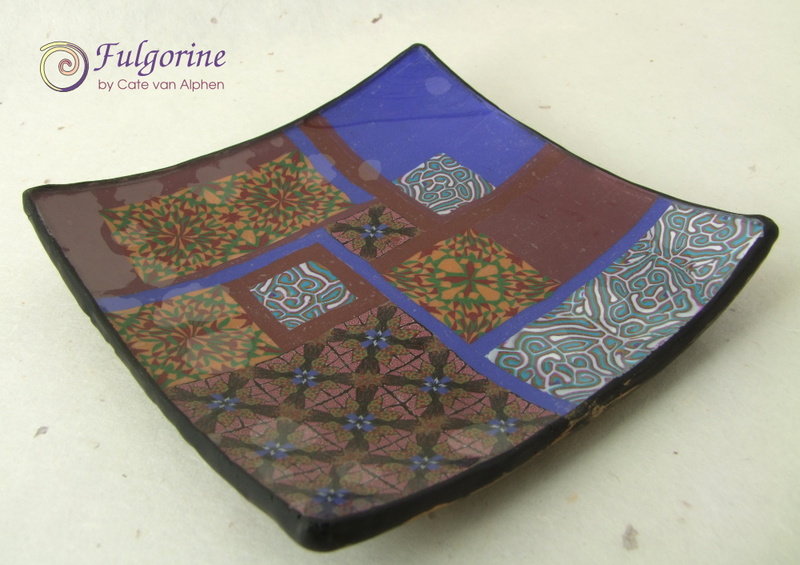 They are visible as the top surface is glass with polymer clay decoration on the underside. I do have an idea for something to try on my next attempt to avoid this. 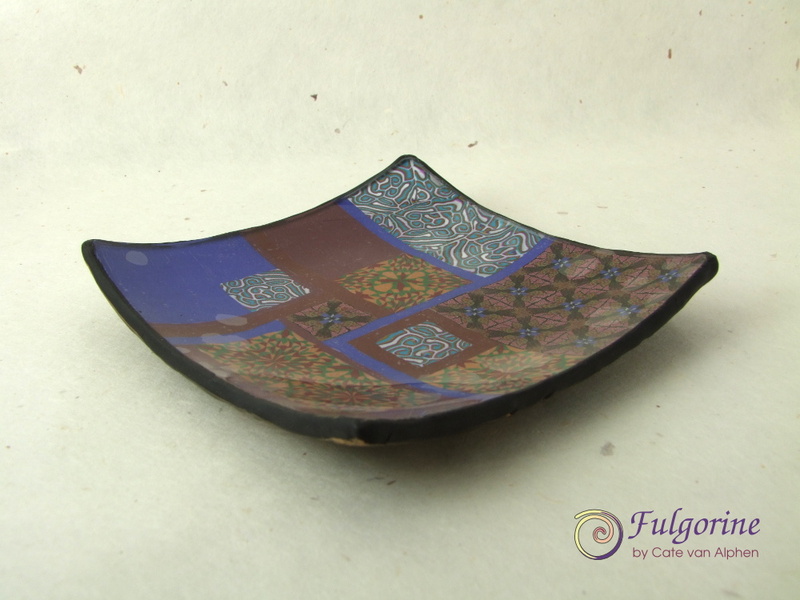 The glass blank is a square with curved edges to make a shallow dish. Luckily I have a few more to practice on. 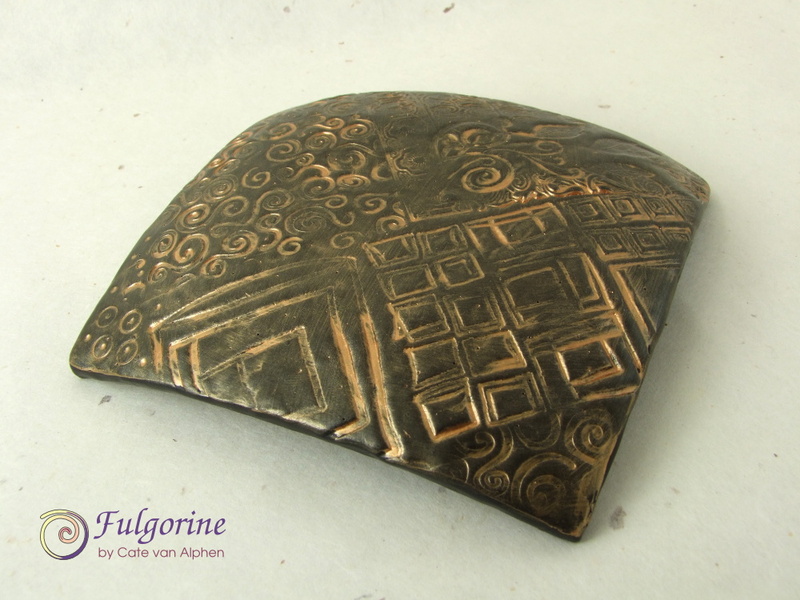 I textured the back and added some gold paint to antique it. I think it could do with a touch of sanding to remove some of the messy paint from the raised areas. But at this point I’m just glad that I made something. 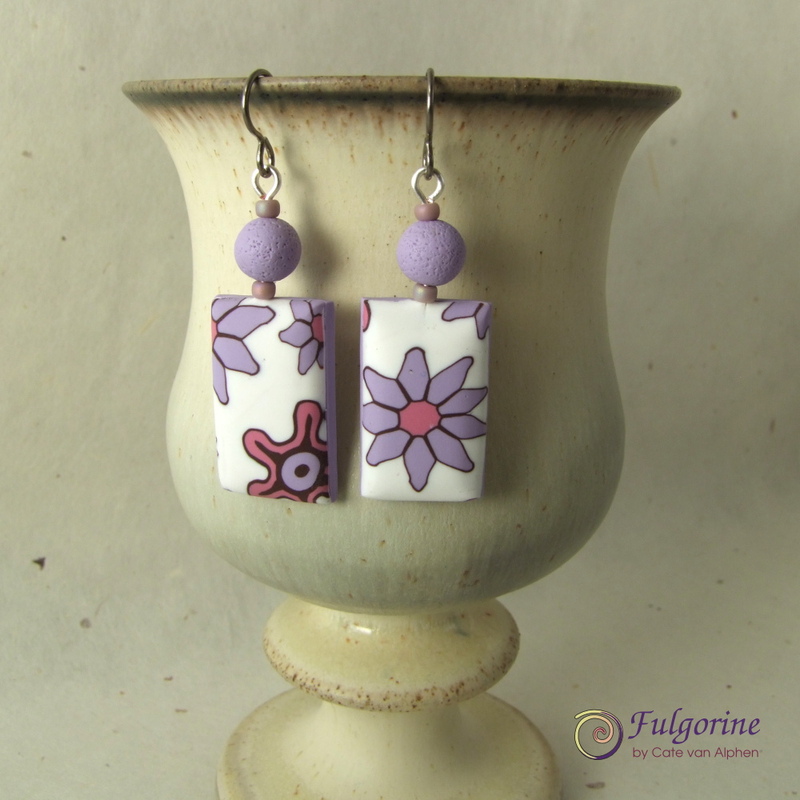 This week I have a pair of earrings to show you for week 34 of 2016 Polymer Clay Challenge. I am working on other things too, but I can’t show you yet. 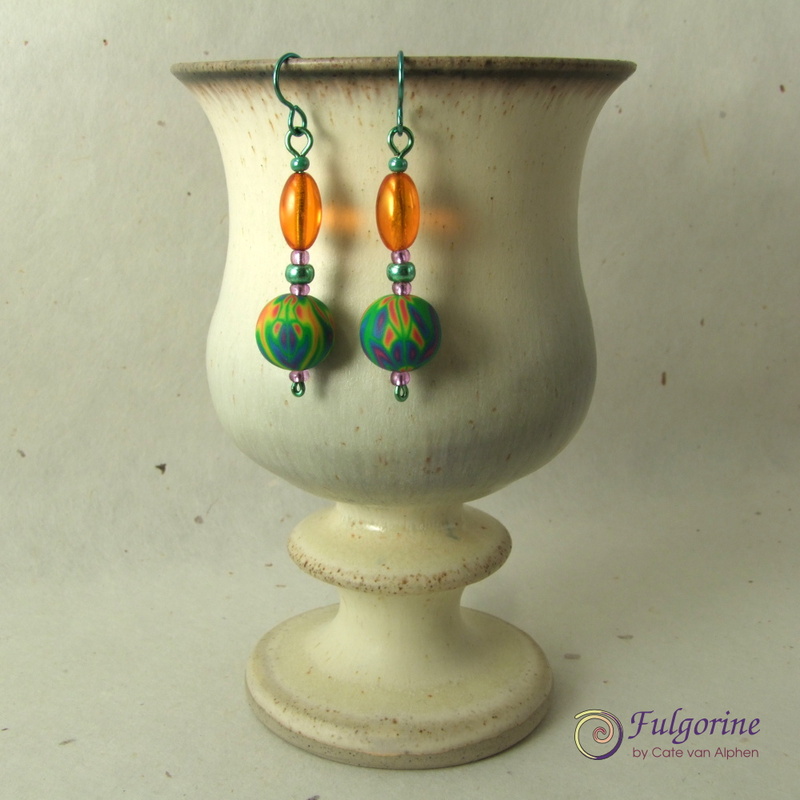 I used a pair of spectrum beads and matched them with the brightest bead combination I could find. 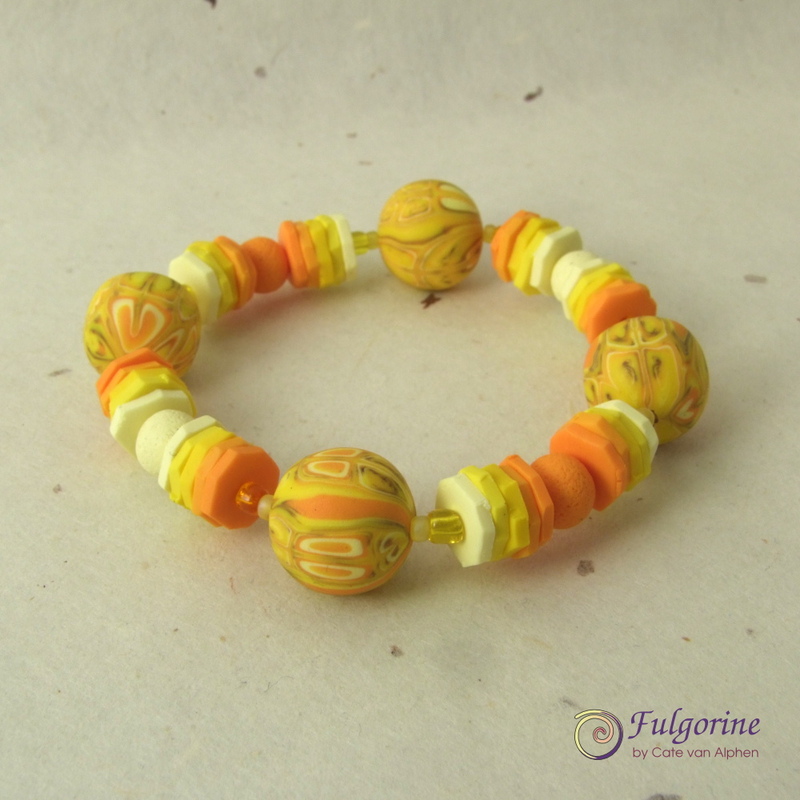 Here are a couple of bracelets that I made using my polymer clay beads. 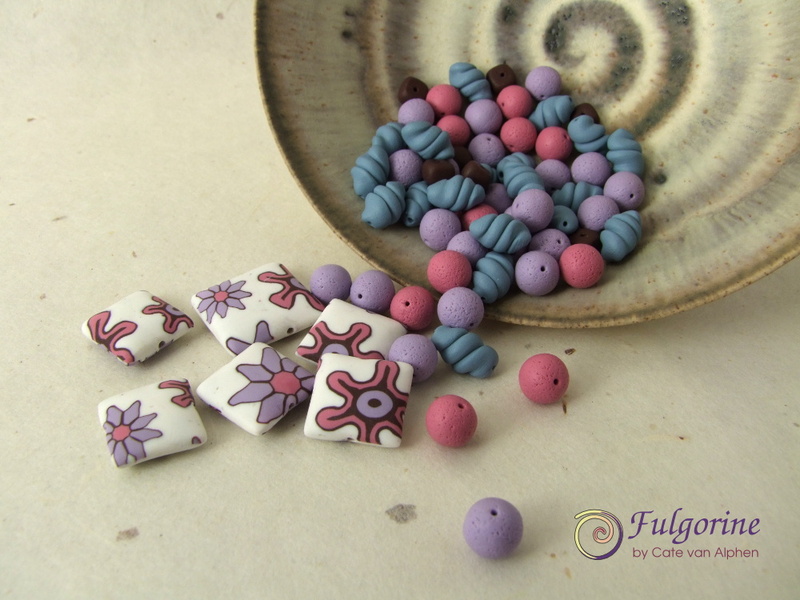 Since I actually made them last week I’ll put them down for week 33 of 2016 Polymer Clay Challenge, even though this blog entry is a bit late for that. I used the colours from my Yellow Palette.